What says autumn dessert better than a Pumpkin Spice Roll? 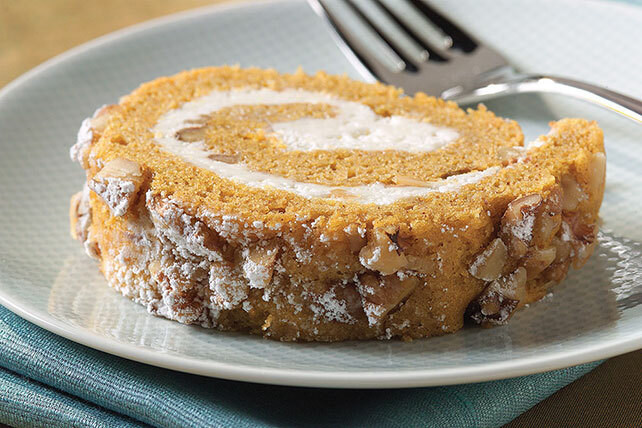 This Pumpkin Spice Roll features a fabulous pumpkin-walnut sponge cake rolled up with a luscious cream cheese and COOL WHIP filling. Sprinkled with powdered sugar, it will look gorgeous on your dessert table. Spray 15x10x1-inch pan with cooking spray; line with waxed paper. Spray waxed paper with additional cooking spray; dust with flour. Sprinkle clean towel with 1/4 cup powdered sugar. Mix flour, spice, baking powder and salt. Beat eggs and sugar in large bowl with mixer on high speed until thickened. Add pumpkin; mix well. Add flour mixture; beat just until blended. Spread onto bottom of prepared pan; sprinkle with nuts. Bake 15 min. or until top of cake springs back when touched in center. Immediately invert cake onto towel; remove pan. Carefully peel off paper. Starting at one short side, roll up cake and towel together. Cool completely on wire rack. Beat cream cheese and 1/2 cup powdered sugar in medium bowl with mixer until blended. Add COOL WHIP; mix well. Carefully unroll cake; remove towel. Spread cream cheese mixture over cake. Reroll cake; wrap in plastic wrap. Refrigerate 1 hour. Unwrap and sprinkle with remaining powdered sugar just before serving. One 15-oz. can pumpkin contains enough pumpkin for 2 Pumpkin Spice Rolls. Use entire can to bake 2 cakes. Use 1 to prepare dessert now; wrap second cake and freeze up to 1 month for later use. When ready to prepare second dessert, thaw cake overnight in refrigerator. Prepare cream cheese filling; spread over cake. Continue as directed.